Nexabond is a unique cyanoacrylate glue specifically formulated for bonding wood. Like other CAs, its main advantage is speed. It reaches most of its final strength very quickly, and that can change your shop workflow. I have never trusted other CAs as mainstream woodworking glues, mostly because of their poor shock resistance. More than relying on data, I could see this myself by easily whacking apart small, simple test joints. I just couldn’t trust those CAs, and trust is everything for a woodworker when it comes to glue. But I’m becoming convinced that Nexabond is different. First, let’s cover the basics of working with Nexabond. By the way, this review is unsolicited and uncompensated. The full cure time to maximum strength for all of the Nexabond glues is 4 hours but Nexabond 2500M builds 2/3 of the maximum in only 5 minutes. 2500S is faster, 2500L is slower. They bond wood to wood and many other materials such as glass, plastic, and metal to wood. The manufacturer says it also works on MDF and oily exotics such as cocobolo and teak. The basic procedure is easy. Apply a small amount of Nexabond – much less than you would for PVA glue – to only one surface and spread. The viscosity of 2500M is a little less than Titebond III, yet it is easy to work with and actually runs less than TBIII because there is simply less glue on the wood. The joint surfaces must meet snugly because this glue is not a gap filler. I’ve found that there is a comfortable amount of open time so there is no rush to get the parts together. Clamp the joint using customary force to bring the joint surfaces tight together. The instructions on the website say to clamp for a “couple of minutes” but I clamp for five minutes with 2500M, assured that plenty of strength will build in that time. No accelerator is used. Small pieces like corner blocks can just be held into place by hand for less time. Aim for minimal squeeze out and use a dry cloth to clean up the excess. 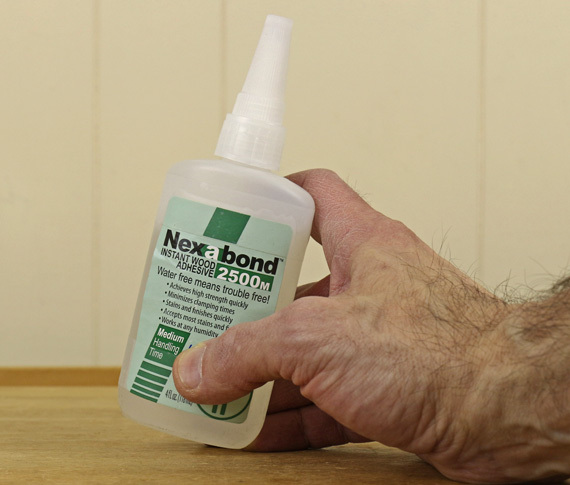 Nexabond glue does not contain water so there should be no joint swelling issues. This is a fast glue, which can be helpful, but the flip side is that parts must come together in the correct position right away because there is very little time for repositioning them once they have met. The glue has a sharp odor and beware, it bonds skin instantly. Unlike most CA glues, the bottle tip doesn’t clog. Shelf life is listed at 12 months at 72°F. Coming up: A closer look at shear strength, endurance, impact resistance, and cold creep/glue line flexibility. Then a discussion of practical uses for this glue and a note about end grain bonding. Thanks Rob, I’ve been using Loctite for certain things and felt its shortcoming were the ones you mentioned. This product looks good. This stuff is way better than Loctite for gluing wood. Coming up I’ll have some info on the properties of the glue that I obtained directly from the manufacturer and is not available on their website. Does the glue develop a mechanical bond like pva or only rely on the glue strength? My understanding is that the adhesive strength of glue, including PVA and CA glues, is mostly created by molecular attraction forces and less from mechanical bonding. In any case, PVA and Nexabond glue bonds are stronger than the surrounding wood. More information coming up on Nexabond bond strength. Looks kinda pricey. Obviously the cost per ounce will be greater than TB3 since you use less of it, but cost per joint would be interesting. Good writeup. It costs much more per ounce than Titebond III but you use a lot less. However, off hand, I don’t think the less amount used per joint fully offsets the greater cost per ounce. I suppose it could be calculated.